Triathlonshop Denmark with all major Triathlon brands and free shipping available! Free delivery of all triathlon products and accessories like triathlonsuits, wetsuits, shorts and tops is available to Italy with a minimum spend to qualify for free delivery. Free delivery is available on all orders. The value of the minimum spend will be displayed in your shopping basket or under the topic shipping costs on our website. 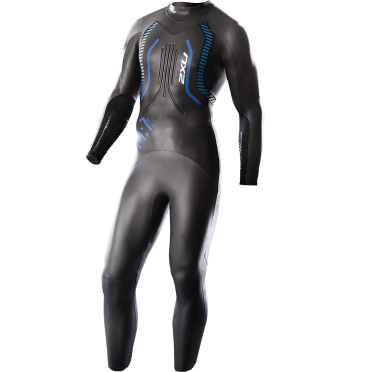 Triathlon Gear, Triathlon Wetsuits, Triathlon Clothing, Triathlon Suits from 2XU, Orca, Ironman, Castelli and many more at triathlonshop Denmark. Free shipping available for Denmark! 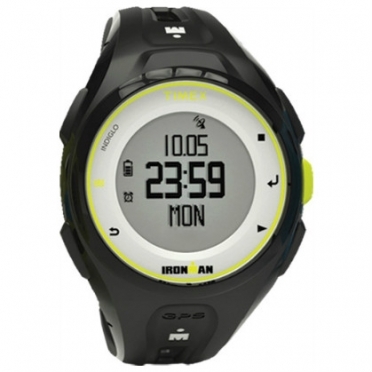 Timex Ironman sports watch Run x20 GPS Anthracite TW5K87300 for many of us, GPS technology has made running more enjoyable—freeing us from the treadmills and tracks, providing motivation when we need it and giving an undeniable sense of accomplishment when it’s all done. But it has also come with the cost of wearing a bulky device that leaves tan lines over half of our forearms. What if you could have all of the advantages of GPS, but with the same ergonomic, streamlined fit of the sports watch that you grew up with? 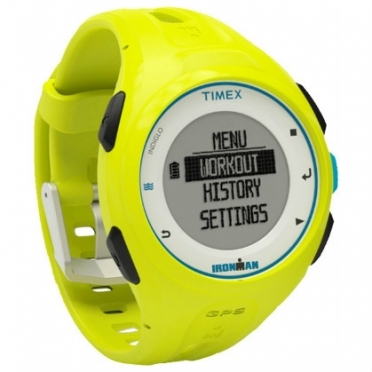 Timex Ironman sports watch Run x20 GPS Lime TW5K87500 for many of us, GPS technology has made running more enjoyable—freeing us from the treadmills and tracks, providing motivation when we need it and giving an undeniable sense of accomplishment when it’s all done. But it has also come with the cost of wearing a bulky device that leaves tan lines over half of our forearms. What if you could have all of the advantages of GPS, but with the same ergonomic, streamlined fit of the sports watch that you grew up with? 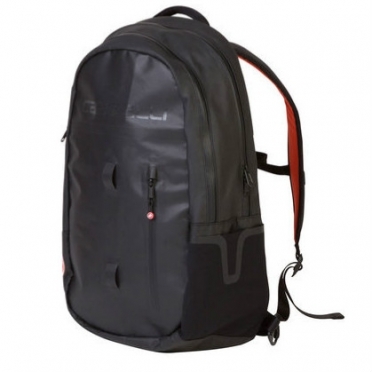 Water and stain resistant Castelli Undersaddle mini with water resistant zipper, water resistant construction and adjustable hook and loop attachment strap. 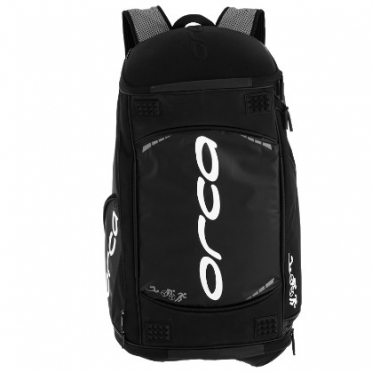 The bag features an internal storage pocket and reflective accents. Dimensions: 5 x 13 x 5cm. Timex Ironman sports watch Run x20 GPS Bright Blue TW5K87600 for many of us, GPS technology has made running more enjoyable—freeing us from the treadmills and tracks, providing motivation when we need it and giving an undeniable sense of accomplishment when it’s all done. But it has also come with the cost of wearing a bulky device that leaves tan lines over half of our forearms. What if you could have all of the advantages of GPS, but with the same ergonomic, streamlined fit of the sports watch that you grew up with? 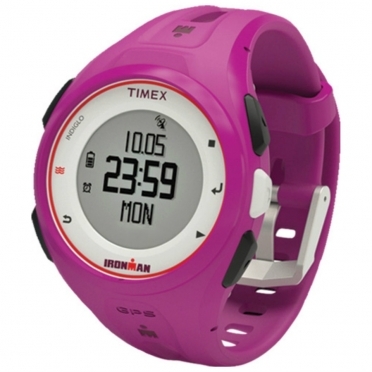 Timex Ironman sports watch Run x20 GPS Magenta TW5K87400 for many of us, GPS technology has made running more enjoyable—freeing us from the treadmills and tracks, providing motivation when we need it and giving an undeniable sense of accomplishment when it’s all done. But it has also come with the cost of wearing a bulky device that leaves tan lines over half of our forearms. What if you could have all of the advantages of GPS, but with the same ergonomic, streamlined fit of the sports watch that you grew up with? 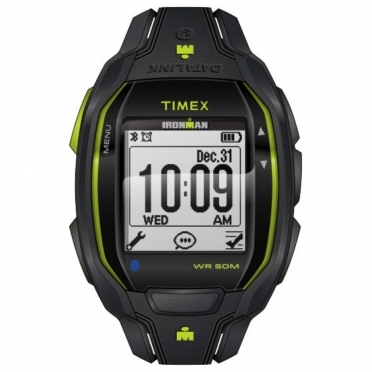 Timex Ironman sports watch Run x50+ w/HRM Anthracite/Lime TW5K88000 we love fitness apps too, but it’s hard to see your progress with your smartphone strapped to your arm. Wouldn’t it be nice to have all that great info on your wrist? We thought so. And for an added bonus, we included music controls and notifications. Lightweight and comfortable design provides fitness enthusiasts with smartwatch. This sporty clock comes with a heart rate belt. 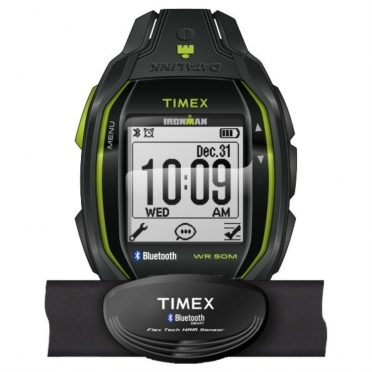 Timex Ironman sports watch Run x50+ Anthracite/lime TW5K84500 we love fitness apps too, but it’s hard to see your progress with your smartphone strapped to your arm. Wouldn’t it be nice to have all that great info on your wrist? We thought so. And for an added bonus, we included music controls and notifications. The Castelli Estremo glove black mens was designed for the coldest conditions–ideal for low temperatures and bad weather. 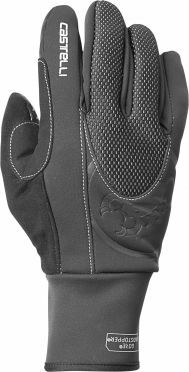 Constructed from a windproof Windstopper X-Fast fabric combined with a fleecy material on the palm, covered with silicone texture for a better grip and durability. Proof that we take harsh winter riding seriously. Tip: keep in mind that the Castelli clothing fits smaller than normal. 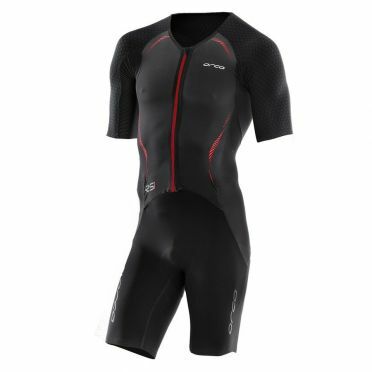 Castelli Free sanremo trisuit short sleeve black men combination of the free tri top and short, in this way this tri suit ensures all the features that are necessary for a comfortable triathlon. Because of the hydrophobic treatment the fabric doesn't absorb water, which makes you faster than your opponents. The Velocity mesh on the back is tested in a wind tunnel and gives extra speed on the bike. Features Castelli's new Tri Kiss seat pad for comfort on the bike that all but disappears on the swim and run. This suit is for you if you race 70.3 and Ironman distance and like the convenience of a 2 piece suit but the comfort of a 1 piece. The Sanremo front makes it easy to ventilate, easy to respond when nature calls, and maintains the aero performance of a 2 piece suit. 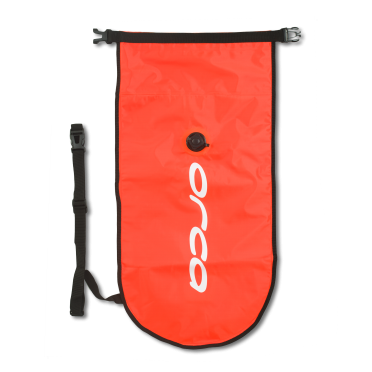 The full pockets on the back lay flat for the swim while providing plenty of space for carrying nutrition on the bike or run. Now exclusive available at Sanden the Ironman PRO Stretch Lace Locks! 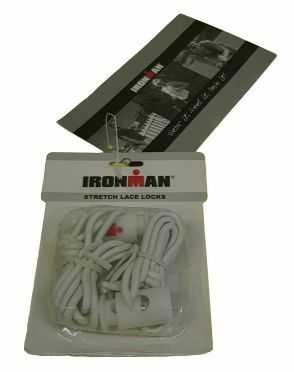 Ironman PRO Stretch Lace Locks are a proprietary elastic lacing system function that are specially designed elastic laces combined with a spring activated lockingdevice. These lock laces are great for running, triathlon or other sports or lesisure time. 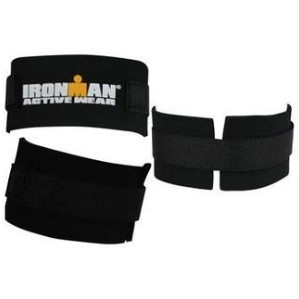 Ironman Pro Stretch Lace Locks are also ideal for kids, eldery or handicapped people. Wear Ironman PRO Stretch Lace Locks with all styles of running shoes, sport shoes or casual shoes. 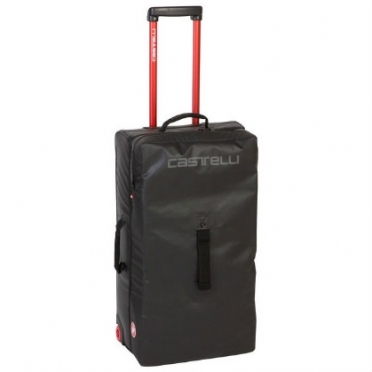 This Castelli Rolling travel bag XL is made of water and stain resistant materials and with semi rigid bottom for support and protection and 2 wheels. Made with all specific features for the cyclist! 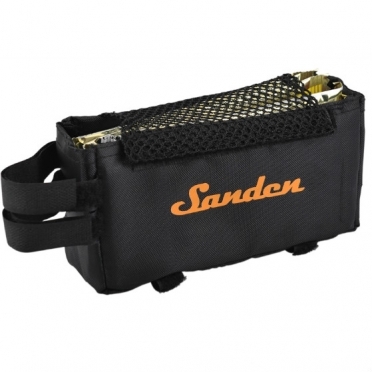 Dimensions: 40 x 74 x 29cm, capacity: 80 L.
You can't think about triathlon without the Sanden Pro tubebox coming to mind. 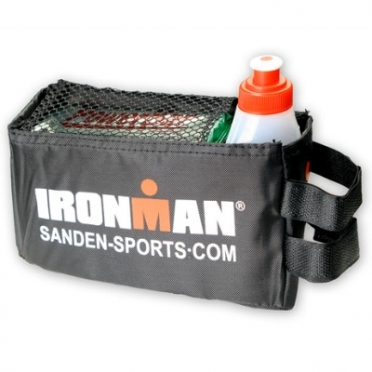 It is ideal for carrying around your energy bars, phone, inner tires or energy gels while cycling. The Castelli Windstopper Balaclava face guard black unisex is for extreme conditions when you need full coverage with Windstopper protection. The front is made of Windstopper X-fast fabric for wind protection. The Warmer fleece fabric feels soft and wicks moisture to feel comfortable under your helmet. The stretchy face opening gives you over-nose, overmouth, or under-chin coverage options. 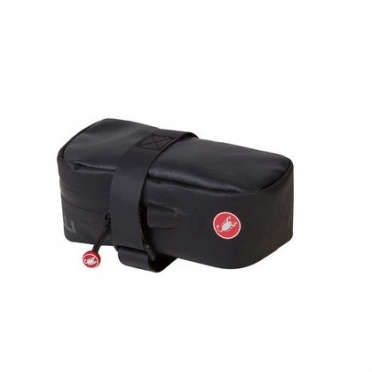 Water and stain resistant Castelli Undersaddle XL with water resistant zipper, water resistant construction and adjustable hook and loop attachment strap. The bag features an internal storage pocket, reflective accents and an external mini pump sleeve. Dimensions: 6 x 15 x 6cm. A squeezable water bottle with the distinctive scorpion emblem of Castelli. The Castelli bottle features a triple function cap with a soft rubber push-pull nozzle for fast fluid delivery out on the roads. 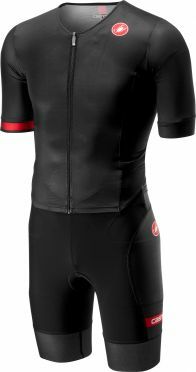 Castelli Nanoflex 2 bibshort black men is made of Nano Flex fabric which provides outstanding warmth and stretch and is water resistant. In wet conditions, water droplets simply bounce off the fabric without leaving a trace. The silicone nanofilaments also trap a layer of air between them for excellent insulation and prevent water from soaking through to the fabric underneath. The KISS3 pad protects you and makes you feel comfortale all day long and the GIRO3 leg grippers lie flat and ensure a nice fit, ideal for spring/summer rides. Tip: keep in mind that the Castelli clothing fits smaller than normal. It's hard to imagine a triathlon without the Ironman Pro tubebox. 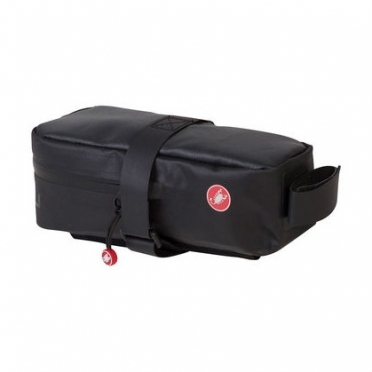 With it's extra large size the tubebox is ideal on your bike to take your energy bar and gel along. - Gelbottle included!